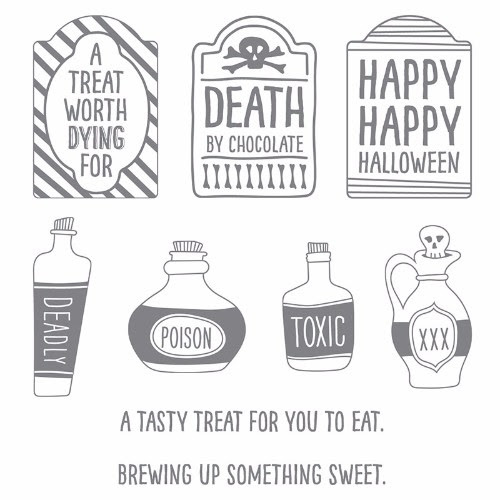 Can you believe Halloween is only a couple weeks away? Here in good ol' Sacramento it is still in the low 90's!!! WHEW! But that hasn't stopped me from getting the house decorated for Fall and planning cute projects and cards. Here is a simple card that you can make a lot of and not have to use a lot of supplies or spend a lot of time. 1. Stamp the bottles along the bottom of the vanilla panel as shown with Archival Basic Black ink. Use the Tangelo Twist maker and the thicker of the two Project Life Journaling pens to draw in a table for the bottles to sit on. 2. Cut out two webs from the spiderweb paper from the Happy Haunting paper pack. Use SNAIL to adhere them to the upper corners of your image panel. Trim even to the sides of the panel, then glue the skinny web strip to the top of the panel overlapping the webs in the corners. 3. Use a wedge of Stampin’ Sponge to sponge the edges of your image panel with Tangelo Twist ink. 4. Stamp the sentiment onto vanilla scrap and cut out as shown. Secure the sentiment with SNAIL to the scrap of Basic Black and then cut out to make a frame. 5. 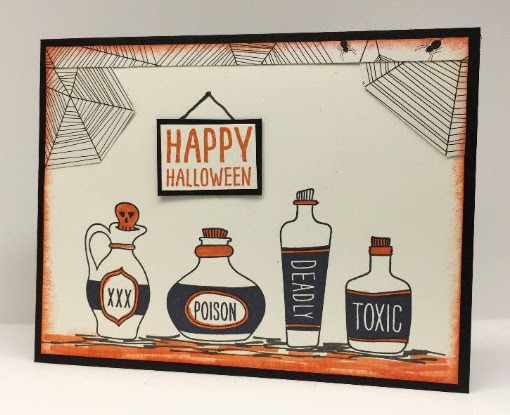 Use the thicker of the two Project Life Journaling Pens to draw a nail and string onto the image panel above the “poison” bottle as shown. Attach your “sign” to the card with a Dimensional. 6. Secure the image panel to the front of your Basic Black card base with SNAIL. Remember, you do not have to be creative to create - just copy this project! Or use it as a template and replace with your favorite Designer Series Paper and ribbon for a totally different look. Order any of these supplies by linking to my ONLINE STORE.